First, I have to apologize for not updating in a month. It’s crazy how busy things were this past month but also, I’ve been busy with my other blogs and working two jobs etc.. time just slips away. I will definitely try to post here more often! A few days before the new California Pizza Kitchen at the Natick MALL opened, we were invited to friends and family night for their trial run. Their new decor is a little more sleek with some “up-lighting” on the back walls. Also, be warned the acoustics in this place are harsh, it was extremely loud in there. Ethan and I were laughing that we kept saying “WHAT?” to each other throughout dinner. The way it works is that we got to pick one cocktail, but could also get a glass of wine, one “starter” which would be an appetizer or salad and each get an entree or pizza. We started off with a glass of cabernet and a pear cocktail that I think was a version of mojito. 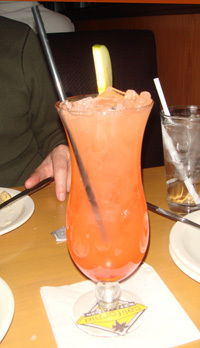 This was okay, it wasn’t the most amazing drink but it was okay. I think it was just lacking any real fruit flavor. It almost seemed like they used unflavored rum but I’m sure they didn’t, I think maybe pear just isn’t a strong flavor for a drink. 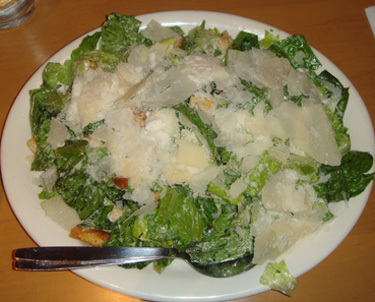 Next we split a Ceasar salad which was really good. The lettuce was crisp and it wasn’t soaking in dressing like some places make their Caesar salads. On top was a generous amount of shaved Parmesan cheese. 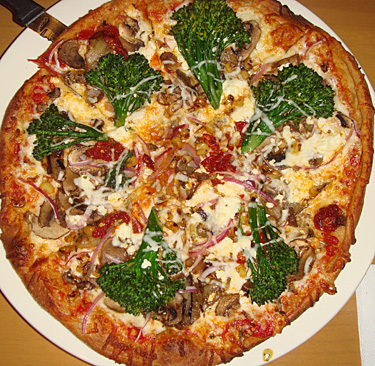 From looking at this you’d never guess Eggplant was the featured vegetable on this pizza but it is in there somehwere. Along with the eggplant were mushrooms, red onions, “baby broccoli” (which seemed like broccoli rabe) corn, goat cheese and sun-dried tomatoes. I got this on honey wheat dough. It was pretty good although I felt like there were too many ingredients. I think if they cut out 2 or 3 ingredients, it would let the remaining vegetables shine. I actually wasn’t interested in trying this but Ethan said it was just okay. 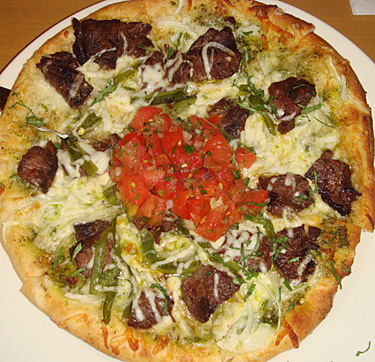 The ingredients in this pizza were (as listed on their menu): grilled steak, fire-roasted mild chilies, onions, cilantro pesto, Monterey Jack, and Mozzarella cheeses. Topped with fresh tomato salsa and cilantro. Served with a side of tomatillo salsa. Ethan likes spicy food and thought this was a little spicy, now I remember that’s why I wasn’t interested in trying this. We wanted to try this because we have heard of it but never had it. I don’t know what it supposed to taste like but this was basically food colored cake with very sugar frosting. It was okay as a cake but I don’t see this difference between regular birthday-type cake and Red Velvet. Although I will keep in mind this is a chain restaurant that is getting it’s desserts shipped in probably from some factory and a bakery that makes it’s own would most likely taste like a completely different dessert. So the California Pizza Kitchen is okay if you’re hungry and at the mall, it won’t blow you away but I’d probably go with one of their salads as an entree if I ever found myself there again. Tags: *Natick · Pizza quest! Proper Red Velvet SHOULD have a lot of cocoa powder in it, giving it a sweet, chocolaty flavor in addition to the red color. It should not taste like regular white/yellow cake at all. Also, it should have cream cheese frosting, not plain white sugar frosting. sounds like CPK has it all wrong. 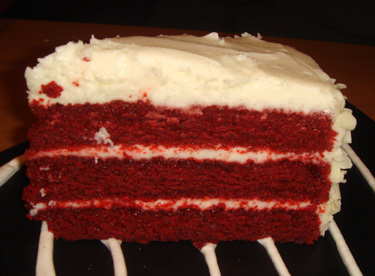 I’ve always wanted to try Red Velvet cake, too, but looks like I should try to find it somewhere other than CPK. Thanks for the review! 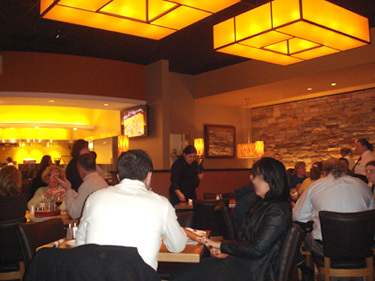 We used to go to the CPK in the old “new” natick mall all the time. My mother and l used to like to share the mushroom and roasted garlic pizza. Always delicious! I LOVE CPK RED VELVET CAKE. I will go out of my way to get it. Trust me, it does not taste like vanilla cake. What the heck are you smoking? I have tasted Red Velv at many bakeries. CPK has one of the best. The icing and filling is key. I am trying to find the bakery that makes it……they won’t tell.